The Virgin Mary appears on a pedestal of cherubs' heads above a crescent moon, bathed in golden light. 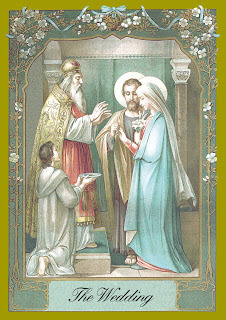 The figures below are her parents, Saints Joachim and Anne. 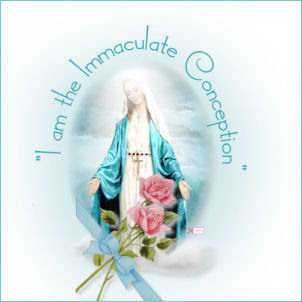 The subject of the Immaculate Conception refers to the Virgin's own miraculous conception in her mother Anne's womb, not to the conception of Christ. 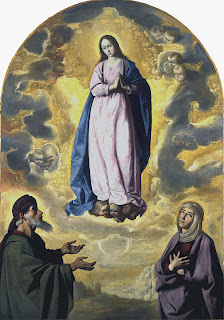 It was a popular subject in Seville, but the inclusion of the Virgin's parents is unusual. Since Saints Joachim and Anna were particularly venerated by Carthusian monks this painting may have been made for a Carthusian monastery. There is, however, no other evidence to confirm this. The following is from St. Michael Center for the Blessed Virgin Mary. Please be sure to visit their site for more prayers, novenas, etc. On December 8, the Catholic church celebrates the Solemnity of Immaculate Conception of Mary- the patronal feast of the United States. It is one of the few Holy days of obligation on the Church calendar -- that is, all Catholics are obligated to attend Mass on this day. As this feast occurs early in Advent, it is a perfect time to consider Mary and her important role in the celebration of Christmas. The Immaculate Conception of Mary is a solemn dogma declared by Pope Pius IX in 1854 which proclaimed that Mary was conceived free from the stain of original sin. This privilege of Mary derives from God's having chosen her as Mother of the Savior; thus she received the benefits of salvation in Christ from the very moment of her conception. This great gift to Mary, an ordinary human being just like us, was fitting because she was destined to be Mother of God. The purity and holiness of the Blessed Virgin Mary is a model for all Christians. -Pius IX, Ineffabilis Deus, 1854.
turn your merciful eyes upon me. which is strewn with dangers for my soul. but may always live a humble and pure life. since my sole desire is to love your divine Son Jesus. let me too attain salvation. 1. Wrapping paper or gift bags? I prefer gift bags. There they so versatile and reusable. 2. Real tree or artificial? Real of course. You can't beat the smell of pine. Right now our home smells so good! 3. When do you put up the tree? Day before Advent so it's just in time for the Christmas tree blessing and Advent Wreath/Candle blessings. 4. When do you take the tree down? Here in Hawaii? Just about the day after Christmas. By that time, that poor thing is dried up. 5. Do you like eggnog? I don't mind it as long as it's homemade...and my mom made it. 6. Favorite gift received as a child? Toots Sweet. A toy that came out after Chitty Chitty Bang Bang. You put in small Tootsie Rolls in and out came out a whistle shaped candy. 7. Do you have a Nativity scene? Yes, a Fontanini. We keep it up all year round. 8. Hardest person to buy for? My Dad??? 10. Mail or email Christmas cards? Snail Mail cards. I love to send out Christmas Cards to family and friends some of whom I only hear from at Christmas time. 11. Favorite Christmas Movie? Don't laugh but A Christmas Story. A serious one would be Miracle on 34th Street. 12. When do you start shopping for Christmas? Beginning of December. 13. Have you ever recycled a Christmas present? Yes. Only because I try not to keep too many gifts for myself when others can use them. 14. Favorite thing to eat at Christmas? Panetone an Italian Christmas cake/bread. 15. Clear lights or colored on the tree? Clear because our tree is decorated with maroon and sage green ornaments and ribbons. It looks very pretty that way. 16. Favorite Christmas song? O Holy Night but there are just so many I can easily list. 17. Travel at Christmas or stay home? Stay home but I wish we could travel to NJ to Christmas with my family. 18. Can you name all of Santa’s reindeers? Yes, if I sing the prelude to Rudolph the Red Nosed Reindeer. 19. Angel on the tree top or a star? Angel dressed in maroon and if you press it, Silent Night starts playing. 20. Open the presents Christmas Eve or morning? Christmas Eve (midnight traditionally but now after Christmas Eve dinner after returning home from the Christmas Eve Family Mass. 21. Most annoying thing about this time of year? The commercialism and people wishing Happy Holidays instead of Merry Christmas. 22. Best thing about this time of year? Other than the birth of the baby Jesus, the extra friendliness of people, the extra thought to the less fortunate. and were outstanding in generosity. what you had inherited from your parents. for which you were thrown into prison. As "Santa Claus" you are still loved today. Teach us to be generous like you! Conversation with Christ: Lord, my trust in you can be shaky at times. My head tells me to have confidence in you, but at a moment of crisis it is easy to lose that sense of trust. My faith is weaker than I care to admit; yet I’m sure that you won’t reject me. Help me to count the many blessings you give me, and to remember that each gift reflects your personal love for me. Moreover, help me to open others’ eyes to your action in their lives. Resolution: I will unite a personal effort (say, an act of charity or a donation) with my prayers for a special intention. ..."We realized that the only vow we ever took in our lives was to love, honor and cherish each other until death. Marriage Encounter and Father Chuck (Gallagher who championed Worldwide Marriage Encounter in the 60's and who gave the following advice to couples: 'It's fine and holy to lift your arms up in praise of God, as long as you put them around each other when you bring them down') taught us that our holiness must begin and end with how we lived out that vow. In other words, we can go to a prayer meeting every night, spend hours in Adoration, go to daily Mass, say rosary after rosary but if we aren't living our Sacrament of Matrimony well, we aren't holy. In fact, maybe we are deeply in sin. Our spirituality is not contemplative. It is matrimonial. We personally believe that matrimonial holiness is one heck of a lot harder to live. For example, we shouldn't ask God's forgiveness for hurting each other if we haven't asked each other's forgiveness first. That's tough..."
From the Editorial by Larry and Mary Sue Eck and appearing in the Winter Issue 2007 of Medjugorje Magazine. Larry and Mary Sue Eck are the Editors and Publishers of Medjugorje Magazine. The Ecks have recently celebrated their 50th wedding anniversary. May God bless them and their family always. For viewing: Francis Xavier and the Samurai's Lost Treasure. A video by CCC and one in a series of videos of saints for younger children. All ages will enjoy it though. Joey and I did at lunch time today. For reading: Saint Francis of the Seven Seas by Albert J. Nevins. M.M., a Visions Book. St.Francis Xavier, patron saint of Goa, died when he was on a sea voyage to China on December 2 in 1552. 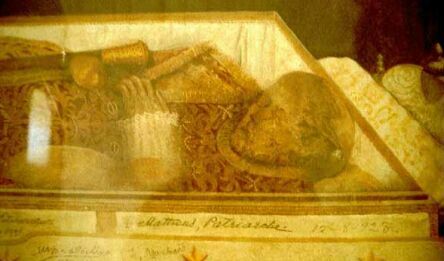 As was wished by him, the subsequent year, at the time of transferring his relics to Goa, it was discovered that the saint’s body was as fresh as the day it was buried. This miraculous phenomenon became a magnet for the devout from all over the lands, and when every ten years, his body is exposed publicly, lakhs of pilgrims rush to have a pious look of the sacred body. Fr. Lombardi, in his public debate with Italian Communist leader Velio Spano in Cagliara on December 4, 1948, stated, "I am horror-struck at the thought that if you continue in this manner, you will be condemned to hell." 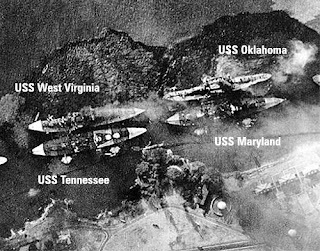 Spano replied, "I do not believe in hell." Fr. Lombardi replied, "Precisely, and if you continue, you will be condemned; for to avoid being condemned, one must believe in hell." Hell is a grave reality that is easily forgotten in today's God-less and apathetic society. This is all the more reason why we should fear for our salvation and do all that we can to make sure that we are one of the elect. St. Leonard of Port Maurice said, "To be saved for all eternity, to be damned for all eternity, and to not make your every effort to make sure of one and avoid the the other, is something inconceivable." Do not let your life pass before it is too late; focus on saving your soul to the exclusion of all other things, lest you find yourself forever in the eternal fires after your judgment. Shared by Sue of Half the Kingdom. BTW, I encourage you to visit her blog and check out the details for The Hour of Grace coming up this Saturday. In Glasgow, Scotland, a young lady, like a lot of teens today, got tired of home and the restraints of her parents. The daughter rejected her family's religious lifestyle and said, "I don't want your God. I give up. I'm leaving!" a job, so she took to the streets to sell her body as a prostitute. The years passed by, her father died, her mother grew older, and the daughter became more and more entrenched in her way of life. No contact was made between mother and daughter during these years. The mother, having heard of her daughter's whereabouts, made her way to the skid-row section of the city in search of her daughter. She stopped at each of the rescue missions with a simple request. "Would you allow me to put up this picture?" It was a picture of the smiling, gray-haired mother with a handwritten message at the bottom: "I love you still...come home!" Some more months went by, and nothing happened. Then one day the daughter wandered into a rescue mission for a needed meal. She sat absentmindedly listening to the service, all the while letting her eyes wander over to the bulletin board. There she saw the picture and thought, 'Could that be my mother?' She couldn't wait until the service was over. She stood and went to look. It was her mother, and there were those words, "I love you still...come home!" As she stood in front of the picture, she wept. It was too good to be true ..By this time it was night, but she was so touched by the message that she started walking home. By the time she arrived it was early in the morning. She was afraid and made her way timidly, not really knowing what to do. As she knocked, the door flew open on its own. She thought someone must have broken into the house. Concerned for her mother's safety, the young woman ran to the bedroom and found her still sleeping. She shook her mother awake and said, "It's me! It's me! I'm home!" The mother couldn't believe her eyes. She wiped her tears and they fell into each other's arms. The daughter said, "I was so worried! The door was open and I thought someone had broken in!" The mother replied gently, "No dear. From the day you left, that door has never been locked." 1. Catholic Customs & Traditions: A Popular Guide by Greg Dues. The reason I selected this book is because it has a chapter on the tradition of Advent. It gives a little history of this season which kicks off the new liturgical year. It tells of its origins and how it evolved into its own liturgical season from that of Christmas. It touches on the penitential theme as well as the advent symbols. Although it doesn't have the imprimatur or nihil obstat that I look for in Catholic books that gives a book that seal of approval I look for, it will at least direct me the right direction when looking for more resources. Publishers Twenty-Third Publications, Mystic, Connecticut ISBN: o-89622-432-5. 2. From the Angel's Blackboard: The Best of Fulton J. Sheen: A Centennial Celebration. I picked up this book as the book I would be reading during Adoration. I haven't been able to put it down. This is the kind of book you read slowly with reflection and meditation as you would the Holy Bible passages. "In recognition of the 100th anniversary of his birth, tis compendium presents his finest and most enduring messages of counsel, wisdom and spiritual healing..."
"There is a legend that one day Abraham was visited in the desert by an Arab, who set up loud complaints of the food, the lodging, the bed, and the wine that his generous host had offered him. Finally, Abraham became exasperated and was about to put him out. Go appeared to Abraham at that moment and said: 'Abraham, I have stood this man for forty years; can't you put up with him for one day?" This beautiful book is published by Triumph Books, Liguori, Missouri ISBN 0-89243-777-4. "The 1960's wrote Bishop Gaughan 'saw churches emptied of many statues. (What Reformation enthusiasts could not do, Catholics did). Devotion to the saints went underground. Many blamed a Vatican spirit as interpreted to them; it betrayed 'true' Catholic belief." At long last, many Catholics have discovered that it was an unfortunate misinterpretation. 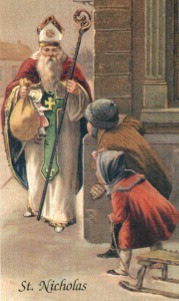 "Far from banishing the saints from the church buildings, the sacred liturgy, and the spiritual life of the People of God, both as individuals and as a community, Vatican II has not only restated the pronouncements of previous councils, but has also set forth in a masterful, concise, and lucid manner the role which the saints in heaven play in the Church on earth..."
3. Venerable Antonio Margil de Jesus, O.F.M. 4. Venerable Felix DeAndreis, C.M. 5. 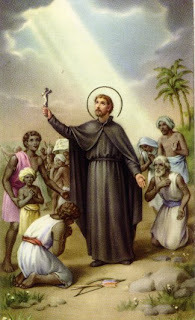 Venerable (now Blessed and soon to be Saint) Damien de Veuster and twenty more. My dear husband will continue to read The Spiritual Exercises of Saint Ignatius of Loyola. It is a book he has owned since contemplating the priesthood over 20 years ago. "Translated from the Spanish with a commentary and a translation of the Directorium in Exercitia by the Late W. H. Longridge of the Society of St. John the Evangelist., A.R. Mowbray * Co. LTD., London: Milwakukke, USA: The Morehouse Publishing Co., Printed in England." You are welcome to the above wreath here or in the side bar which is smaller. may be helped by her intercession with You.